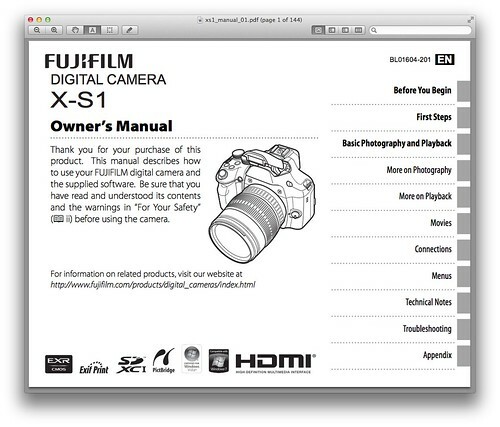 The official user guide for the Fuji X-S1 is a 144-page, 2.6 MB PDF document titled “Fujifilm X-S1 Digital Camera Owner’s Manual”. Use this link to download the operating instructions to your drive or view it directly in your device’s browser. Normal mode: Approx. 30 cm (0.9 ft.)-∞ (wide angle); 2 m (6.5 ft.)-∞ (telephoto). Macro mode: Approx. 7 cm-3 m/0.2 ft.-9.8 ft. (wide angle); 2 m-3.5 m/6.5ft.-11.4 ft. (telephoto). Super macro: approx. 1 cm–1 m/0.3 in.-3.2 ft. (wide angle).